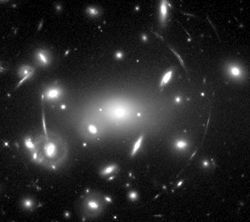 The arc pattern you see in this Hubble image is an example of whats known as gravitational lensing. This effect occurs when the powerful gravitational field of a massive object--in this case, a cluster of stars--bends, magnifies, and brightens light emitted by much more distant objects. The magnification acts as a powerful zoom lens to view extremely remote, ancient galaxies not otherwise visible, boosting our understanding of their structure and evolution. Hubble has granted astronomers their first opportunity to study gravitational lensing, as the effect is very difficult to detect with ground telescopes. Read more about gravitational lenses and how they affect light coming to Hubble on the Space Telescope Science institute website.